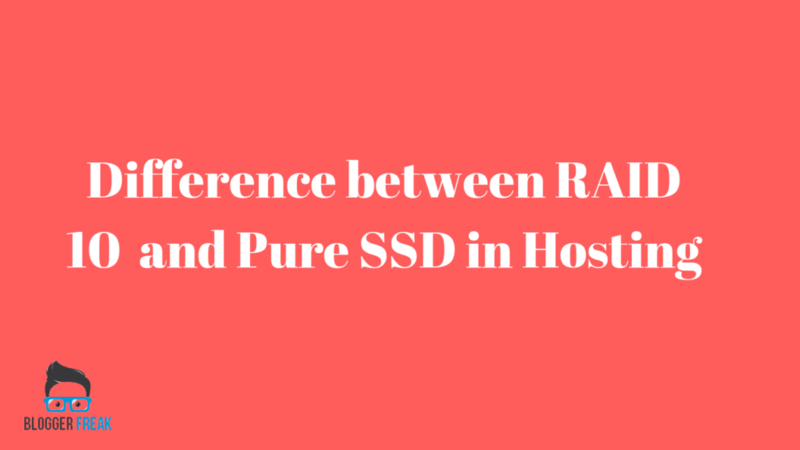 What is the difference between RAID 10 and a pure SSD in web hosting? Home » Web Hosting » What is the difference between RAID 10 and a pure SSD in web hosting? Solid State Drives have dropped in price leveraging great performance benefits everyone. But does this translate the benefits of a performance boost when utilizing an SSD hosting? But How? We will look into expectations of why you should be looking at Best SSD hosting? But at first, let see what’s actually is an SSD. Solid State Drive basically a non-volatile memory that stores information unlike the RAM (non-volatile) in which the data get deleted when the power is lost. SSD doesn’t have such issues. But most probably an SSD is used to gather more speed than the traditional spinning Hard Drive. So, there are no seek time (the time it a storage drive to take find the data on the drive) it’s more reliable and faster. In terms of I/O operations, the transfer rates are blazing fast and take load up to 2x greater than the traditional Hard disk drives. But what makes an SSD (Solid State Drive) being used in a Web Hosting. Particularly the benefits are enormous. The benefits of using a faster drive help in accessing data quicker and the software on your server to operate efficiently. Today modern websites have the prerequisites of generating pages from hundreds of databases queries. Similarly when you have the website build on either of open source applications such as WordPress, Joomla,and Drupal due to their usability and numerous customization options. There are numerous web hosting that offers countless features in their plans. However the most suitable and demanded one that offers SSD hosting. In Web Hosting we have seen hosting companies competing for each other on features and specification,however, the primary function of the introducing an SSD can be understood using the below example. For instance, when a visitor enters a dynamic website such as WordPress and the visit triggers databases queries along with the content accessed at the same time. Web hosting that boasts spinning hard drive having the data may take longer than an SSD Hosting. To be more specific and HDD stores information on rotating disks that actually works with the actuator arms that read/write in order to access the data(physical moment) so as the visitors have to wait long to get the website loaded fully. With Solid State Drives data is read and written simultaneously hence, the browsing no longer seems choppier and experience will significantly get more pleasant due to less reloading time. There are variable speeds counted when used a Pure SSD with SSD RAID 10 the latter helps in the acceleration of performance on the raid 10-arrays. Have a glance at both the plans that of an SSD hosting an SSD RAID 10 hosting (also known as cached SSD). And the benefits drove from one of those. Pure SSD refers to using an enterprise level SSD that is used as a storage device on a server. This means you get to see faster access to data and performance boost during the normal operation on websites. An SSD hosting costs a little higher than traditional hosting due to Solid State Drive cost more and possible because of the speed it offers that guarantees performance and faster access time. The Pure SSD hosting offers less space that of Spinning drive and it’s great for people who need the sites to load fast or having a large database that initiates a lot of I/O activity other than a conventional hard drive. An SSD Accelerated plans are consist of different things such as a Conventional hard drive for storage and SSD for churning out the best speed basically for caching purposes. In simpler terms SSD RAID-10 it’s the SSD where most of the data get stored such as files and databases that are accessed more frequently or viewed are loaded quick. However, an SSD can take up 50x more activity than a conventional hard drive such as reducing the activity if it’s a spinning hard drive whereas an SSD drive keeps performing and doesn’t get slow over the time.